Nova Biomedical Stat Profile Prime #53657 Critical Care Analyzer Diagnostics . New Life Scientific, Inc.
* Being sold For Parts due to unknown password to login. The Stat Profile Prime is in good cosmetic condition, with an obvious screen blemish, and it is missing is the power adapter. The system was due for a PM December 2017. 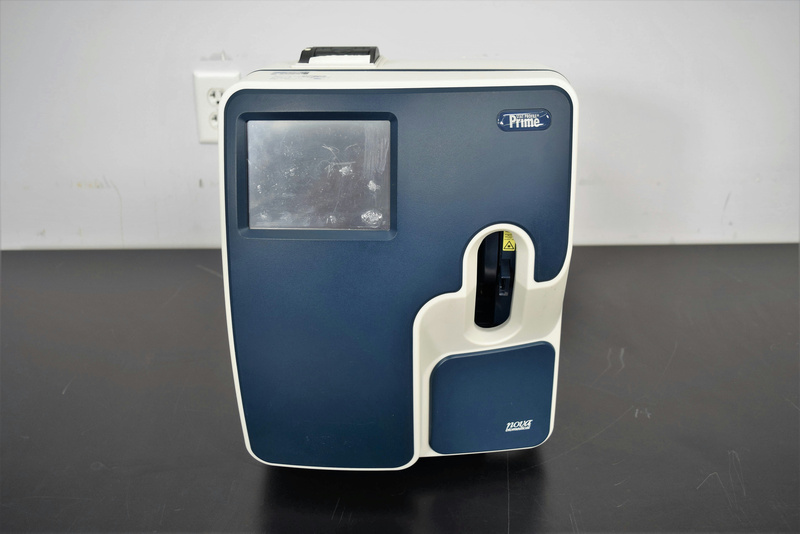 The manufacturer touts that the analyzer has 10 critical care menus including blood gases, electrolytes, metabolites and hematology (pH, PCO2, PO2, Na, K, iCa, Glu, Lac, Hematocrit). The technician powered the instrument and noted an additional password is required perform basic operations (e.g., sample-run). The manufacturer was contacted for tech support, but they were unable to bypass the security setting. This product requires a power adapter, unclogged sample tubing/hoses, and a service call from the manufacturer to enable access to the instrument's controlling software; therefore, this product will be sold for parts / repairs only. "Stat Profile Prime® Plus is a modern blood gas analyzer. It analyses blood gases, electrolytes, metabolites, CO-Oximetry and 32 calculated results from a small whole blood sample. The analyzer combines maintenance-free, replaceable cartridge technology with a patented, new, non-lysing whole blood CO-Oximetry technology. Prime® Plus results are produced very rapidly, a complete test menu panel in one minute, and are combined with bidirectional connectivity and a powerful onboard data management system."